The number of tourists visiting Nepal is expected to reach an all-time high of 1 million this year, recovering from the slump after the earthquake and blockade in 2015. Much of this is not because of placing commercials on cable news channels, but because of a new social media and digital strategy. The Nepal Tourism Board (NTB) says positive feedback from tourists on sites like TripAdvisor and Agoda as well as posts on Instagram or Facebook are much more effective in attracting visitors to Nepal. Which means the country could reach the target of doubling arrivals to 2 million by 2020 by having greater online outreach. “Digital marketing is extremely important to promote Nepal’s tourism, and the best part about it is that we can measure the impact of the money we spend,” said NTB’s Deepak Raj Joshi. NTB spent Rs60 million on digital marketing in 2016-17 – including partnering with TripAdvisor, and believes this contributed to the post-earthquake tourism rebound. This year’s budget has been increased to Rs80 million, and this includes collaborations with Lonely Planet and others. Although NTB still buys costly airtime for commercials on mainstream media like CNN and BBC, they are not as effective anymore. Cook, who participated in an International Travel Blogger’s Conference earlier this year in Kathmandu, says Nepal needs “aggregation” – gathering, filtering, purposing and repurposing content from visitors and using this in targeted social media campaigns. Since that conference, global media listed Nepal as the country to visit in 2017. The endorsements were widely circulated on Facebook and Instagram, and NTB sponsored content about Nepal on Facebook to attract Indian tourists. Indeed, 70% of web traffic today is video content, and by 2020, that number will be 83%. Shubic says a more effective, and affordable, marketing strategy for Nepal would be to either sponsor content development, or run pre-roll ads on targeted video content on websites like YouTube, ROKU and DirecTV. “Tourism needs people who can capture stunning photos, write helpful content and film compelling footage to be disseminated and shared on social media,” he adds. When people travel they post four times more pictures and videos on Facebook or Instagram pages. The video ‘48 hours in Nepal: Kathmandu and Beyond’ by Nepal visitors Anne Mugnier and Jeff Johns has been viewed by 1.1 million on Facebook. However, social media can be a double edged sword, and visitors feedback, for instance, on the poor quality of roads, long waits at airport immigration and overcharging can also spread negative publicity. Which means the only way to increase tourism today is to provide better value and quality service to indivdual travellers who then post feedback online. Bloggers Anne Mugnier and Jeff Johns went to bed after posting a video of their Nepal trip, ‘48 hours in Nepal: Kathmandu and Beyond’ on Facebook. When they woke up, it already had 270,000 views. 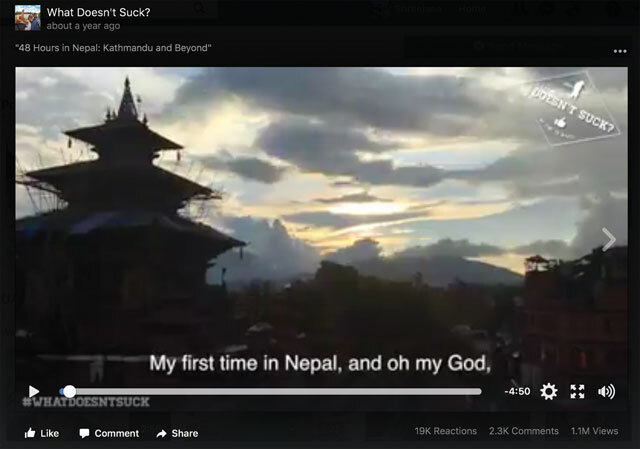 It was shared by Nepalis as well as viewers who excitedly started planning trips to Nepal. It already has 1.1 million views on the couple’s Facebook page. Most of their travel videos do phenomenally well, Johns wrote in an email interview. The couple live in Dubai and blog about their travels on www.whatdoestsuck.com, where they also provide travel advice and feature their blog series, 48 Hours. When the video of a British trekker Gemma Wilson being chased by a Nepali tea-shop owner for bargaining over a cup of tea on the Annapurna Circuit went viral on the Internet last month, Nepal’s tourism promoters were worried. Within a week of appearing on the Daily Mail website, the clip had been viewed 15 million times, and was widely shared by the mainstream media. However, instead of support, the British woman was heaped abuse on the website as well as on most reposts on the social web. She was ridiculed for bargaining, while the obviously overworked and underpaid Nepali woman even got some praise for chasing her customer so determinedly up the mountain, venting her anger using such pithy words. The British tourist was also criticised for selling the clip to the Daily Mail, and for trying to make money out of the episode. The growth rate of tourist arrivals after the 2015 earthquakes is impressive – 33.5 per cent this year compared to last, according to the Nepal Tourism Board (NTB). From January to August 2016, 424,058 people visited Nepal. This year, 566,221 tourists arrived during the same period. Indian tourists top the list (93,049) followed by Chinese visitors (66,415). 2012 was Nepal’s most successful tourism year, with eight million visitors. However, he is worried that visitors might cancel their bookings because of federal and parliamentary elections slated for November. “The government must spread a global message that Nepal is safe to visit during the November election,” said Shah. Like other tourism entrepreneurs, Acharya pinpoints the limited capacity of Kathmandu’s airport as the major bottleneck for tourism in Nepal. Innovations in Nepal’s tourism Industry, Siddharth Inc.